Platinum targets PS3 as lead platform. Platinum Games is on a mission with its upcoming shooter, Vanquish. In the wake of the disappointing reception offered to the third-party PS3 conversion of its last title, Bayonetta, the developer has switched to the Sony platform as its lead console. "The PS3 is kind of like a sports car that's very high-performance and specific in its usage, whereas the 360 is more like a car that everybody's driving. It doesn't have the same range as a sports car, but it has more versatility," producer Atsushi Inaba told VG247 during E3. "It's about adapting your game to those two sorts of different framework. That's where we're focusing. Fundamentally, the gameplay experience itself is the exact same game." The recent release of playable demos on both PS3 and Xbox 360 allows us to put Inaba-san's claims to the test, but whether the results of this analysis will remain relevant in the context of the full game remains to seen. The content of the demo is said to be exclusive, and it appears to be very similar indeed to the code seen at E3. It's not very often that early code is released into the wild as a full-on playable demo, but Vanquish appears to be one of those exceptions, plus the content we're looking at now may not even be in the full game. Assuming that the engine has been locked down, performance analysis of the two respective demos throws up a pretty big discussion point. The key difference seems to be that the Xbox 360 goes for a conventional capped 30FPS, double-buffer approach (losing v-sync when dropping under the target frame-rate in order to maintain fluidity) whereas the PS3 game employs triple-buffering, effectively ensuring that there is not a single torn frame any time during the gameplay experience. The Xbox 360 version feels a touch more responsive, but whether this is down to the double-buffering or a slightly higher average frame-rate is something we'll need to take a look at in more depth with the final review code when it appears. It's also worth pointing that while the tear-graphs in the video suggest that the tearing is a problem on 360, the neutral colour schemes combined with minimal lateral motion make it far less noticeable than you would imagine. As it is, both demos operate at the same rendering resolution: 1024x720, with 2x multi-sampling anti-aliasing. 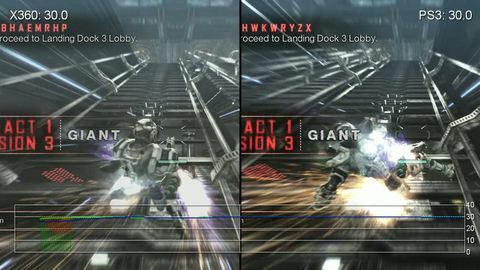 Aside from minor differences in the shadowing implementation, the rest of the game's many and varied post-processing effects and its object and camera-based motion blur appear to be effectively identical. With Platinum Games handling both versions of Vanquish, it appears that PS3 owners can breathe easy after the Bayonetta debacle: this demo is excellent fun and technically solid on both platforms. Indeed, it may well be the case that the addition of v-sync could give the PS3 version the edge, though further testing on response and performance in like-for-like situations is clearly warranted. It'll also be interesting to see if the presence of screen-tear on 360 has more of an impact in different environments. Vanquish launches on 22nd October, and we'll be looking at it in much more depth in the inevitable Face-Off.